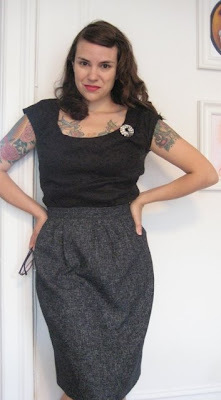 Gertie's New Blog for Better Sewing: The Slim Skirt: A Modern Re-do! The Slim Skirt: A Modern Re-do! I decided to tackle the slim skirt again--this time using all modern techniques and equipment. I made lots of changes from the lavender version I made, in which I strictly followed all of the instructions in Vogue's New Book for Better Sewing (VoNBBS). The first thing I did was to make a couple tiny pattern alterations. I took in an inch at the waist, and added more taper to the bottom of the skirt. I also shortened it a bit more--I wanted this version to hit just a smidge above the knee. I think these changes give the skirt a more contemporary look, much like these current offerings at Anthropologie.com. But the real changes were in the construction. In stark contrast to the lavender version I made, for this version I purposely did as much by machine as I could. In fact, the only things I did by hand were to attach the waistband to the skirt on the inside and to tack the vent down. 1. I used interfacing in the waistband. I thought it odd that VoNBSS did not suggest this. 2. I serged the raw edges rather than hand overcasting. 3. I used a machine blind hem rather than using seam binding and hand stitching. 4. I did not even attempt a handworked buttonhole this time, I went straight for my machine. 5. I substituted the lapped zipper with an invisible zipper. But the biggest change I noticed was in my attitude. With the VoNBBS version, I was committed to a very slow, detail-oriented process. VoNBSS told me the skirt should take 9 hours to make, and I definitely took that, if not longer. There were frustrations along the way, but for the most part, I was relaxed and enjoyed the ride. With this modern version, I somehow got it into my head that I had to go as fast as possible so that I could see how much time my modern methods saved. Well, this was a disaster. Because I was rushing so much, I accidentally sewed the skirt inside out! I even applied the zipper to the outside! Yes, that's right. I sewed the zipper to the outside of the skirt. Had I not had so many mishaps, this version would have taken under two hours, from cutting to finishing. But is that really the point? To whip something up as quickly as humanly possible? I love a fun, quick project as much as the next lady, but it's good to remember the virtues of slow sewing. The fabric I used is a fantastic rayon-cotton blend from Gorgeous Fabrics. It's a mix of colors--navy, black, and white--giving it a tweed look. I love the fabric so much that I've now made a pair of pants, shorts and a skirt from this fabric! A dress is probably in the works too. I bought six yards of it! It unfortunately seems to be sold out now, so I'm glad I did. Regardless of the problems (inside out zipper - BTDT! ), your skirt turned out beautifully. Very flattering on you! I have learned that I need to step away when I am going to fast! I am making a vintage 60's pattern right now but with modern techniques. Since, I think,I know what I am doing...I tend to go too fast! I really love your projects that you are turning out. I will keep my eye out for your patterns! Love the skirt. Very flattering! WOW!!! i love it. You really rock that outfit. "Better Homes & Gardens, Sewing Book"
Under the section regarding when to use interfacings it states: "Once, when you wanted to make a tailored dress you had to pick from fabric suitable for tailoring"
maybe that sheds some light on that. Either way, the new skirt looks great! Kristina, that's a good point. I did a little more digging on the interfacing issue. VoNBBS does suggest interfacing for a couple projects in the book, but it refers to interfacing as another fabric that adds body to your fashion fabric. It suggests canvas for heavier garments and muslin or taffeta for lightweight ones. Perhaps there was no such thing as dedicated interfacing yet, so it was still used sparingly?